Home » Browns » Too much to ask? Someone’s been reading Kanick. Well-done Mr. Grossi. Are we getting fired up yet? This weekend, next week, is this year’s version of last year’s three-picks-in-the-top-37 draft weekend. Next week will either turn the Browns into a playoff team or leave us looking at another top-10 draft pick in 2014. Given that the Browns enjoy more cap room than most other teams and given only one draft pick in the first 67 and given the number of teams struggling with cap space… the Browns are in great shape to address several holes with top notch talent. I’m as big a ‘build-through-the-draft’ guy as you’ll find and this year’s draft offers a good deal of hope in that at #6 overall, elite talent will be available. But this is a unique year in free-agency and here’s hoping the Banner-Lombardi team recognize it as such. This is the year where three top-end starters in positions of need should be the goal for free agency. Blah, blah, blah, enough… here’s my take on all this. Here’s how I’d use FA and draft to plug the Browns holes. 23 passes-defended. No missed tackles. This seems so clearly to be the number one need that I don’t want to spend a lot of time on it. Undersized and will be out-muscled by stronger receivers at the next level. Tight hips limit his ability to chance direction quickly. Over aggressive at times and can be fooled by play action. Boxed out by bigger receivers in jump ball situations. Does not have the strength to shed blocks and is a poor tackler. The move: Keenan Lewis in FA. We had him as our pick three weeks ago. We liked his no missed tackles. That no WRs got over 100 yds on him. That he did well against other teams’ #1 when Ike Taylor was out. But we keep finding more and more things to like. For example, his 23 pass defended last year was second only to Richard Sherman. And it quite a bit more than Haden’s best year (19). The video we’ve watched has done nothing but make us more jazzed to get him. Alternate move: None. Even though the free agent CB crop looks deep — Cox, S. Smth, Toler, Grimes, Williams, Talib, DRC — I don’t see anyone in the draft or FA who is in Lewis’ class. This is the must-have signing. 2. Edge speed on defense. The question is whether he drops to #6. Everything I understand about the 3-4 is that it capitalizes on fast, athletic OLBs/DEs on the edge. The closest we had to this, Marcus Benard, was released in January. To say that filling the unique personnel requirements of the 3-4 is ‘challenging’ is to undersell it. In the six years of RAC/Mangini 3-4 defense here are the OLBs/DEs that didn’t work out: Matt Stewart, Chaun Thompson, Willie McGinest (37 years old), Kam Wimbley, Matt Roth, Scott Fujita. It calls for an elite and versatile athlete. Layer on that there’s no ‘attacking’ drill at the combine and it becomes a bit of crapshoot to find that edge guy. They tend to be selected in the top-10 of drafts and so that’s where we want to look. I’ve left this position vague because with the move to 3-4 we need both a fast, athletic OLB and also a tall athletic 5-tech DE. The move: Hope Ansah or Jordan is there. I’m anti Jarvis Jones here, do not like the injury reports. Alternate move: Eschew expensive free agents here. I don’t want Kruger; I’m concerned about Avril’s performance drop off last year; Michael Bennett plays in a 4-3 and plus, the Bucs didn’t franchise him. (The Ravens and Lions have cap reasons for not keeping Kruger/Avril.). So I don’t love any of the these edge guys. 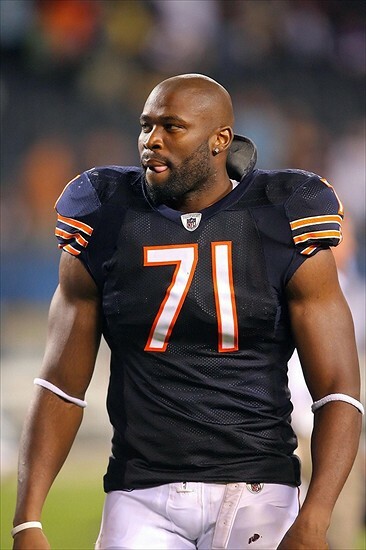 If pushed me to pick a FA edge guy, Israel Idonije could work. I could get behind a three year contract for the 32 year old, expecting him only to play two. And not for nothing but Richard Seymour is a 33 year old free agent in need of a home. I’d give his agent a call. Why yes. 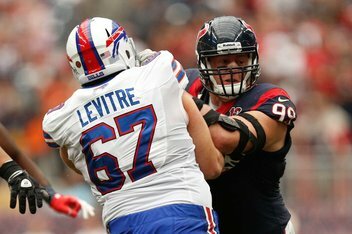 Yes, that is JJ Watt neither terrorizing a QB nor extending his arms. Seems like we got lucky last year by finding Jon Greco. It’s happened before; Billy Yates was fantastic in the short time he was here. But as it stands we have converted tackle Jason Pinkston trying to come back from a life-threatening blood clot. Underwhelming Shawn Lauvao on the other side of the line. Journeyman Jon Greco. And behind them is Ryan Miller. OK, GET READY TO LAUGH. YEEE-OWWW!! You don’t want to be his quarterback. 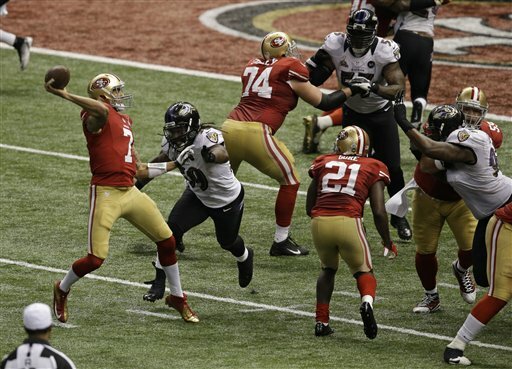 Try to find a google image search on Cooper where he is NOT in this perfect blocking position. You can’t. While we thank Ryan for the emblematic consecutive plays of the Shurmur era, we don’t want to go to war with him. And if you were watching these two plays live: three minutes to go in 24-10 final game loss… it surely prompted a moment of somber introspection on how better you might have spent that Sunday. The move: Andy Levitre in FA. But we’re resigned to the probability that Levitre will be expensive; we’re not counting on this happening. Alternate move: If Ansah and Jordan are gone, and if Levitre was too expensive in FA, I would be fine grabbing a guard at #6 in the draft. That guard would not be Chance Warmack; it would be Jonathan Cooper from UNC. Click for draftbrowns.com profile of Rambo on which we’re piggy-backing. A ball-hawking safety might be a useful thing, no? If you don’t think so, it’s understandable. Since Eric Turner’s nine Ints in 1994, the gold standard has been Earl Little with six in 2003. I kid you not. I hope we’re in agreement that Usama Young must never play here again, yes? The move: Bacarri Rambo, UGA, in 3rd round. TJ Ward + Patrick Chung = Duck reunion. Alternate move: I’m also interested in the price for Patrick Chung from the Pats. He’s played FS before and -mainly- he was an Oregon Duck teammate of TJ Ward’s… might help both. And we just wouldn’t be doing our job if we didn’t take note that Gerald Sensabaugh was released by the Cowboys. He deserves a look-see if only for his stoning of T-Rich on this 3rd and 5. Proof: pass rush can come from a 3-4 ILB. Inexplicably, we’re staring down yet another year of searching for new linebackers. Banner, Chud, Lombardi, and Horton just don’t get the deja vu this is creating for Browns fans. But as long as we’re looking, tt would be nice to find a guy who brings an edge, an attitude, a mean streak. Someone who hits. Browns haven’t had a dominating, and I mean DOMINATING, linebacker since… Chip Banks? Clay Matthews always felt more ‘competent’ than ‘dominating.’ Kinda like a Jack Ham vs. Jack Lambert. I hoped DQ will emerge as a playmaker/star as a Mike linebacker, but he hasn’t. Sure he gets his tackles, but it always seems like it’s after a four yard gain. Without looking it up, I would guess the TFLs and stuffs are coming from Winn, Hughes, Rubin. The move: Dannell Ellerbe in FA. Alternate move: Alec Ogletree is my favorite college player in this year’s draft. He just always seemed to be blowing things up. You always knew when he was on the field. If Ansah/Jordan are gone, if the Browns don’t want to go OG at #6, Ogletree would be a good/great pick. He’ll be a star in the league. Come back to the midwest you Boilermaker. Football Outsiders hates our tight ends. Watson was 38th in DVOA; Cameron was 42nd. They use their DVOA (Defense-adjusted Value Over Average) stat to measure such things and while we usually suspicious of too much reliance of such data, here it confirms what we felt. Our TEs are not great. I haven’t completely given up on Jordan Cameron. But I almost have and it does look like a position where we could improve ourselves. I frankly don’t care whether we get a playmaking TE or a blocking TE. I just want him to be elite in either. The move: in the likely event that the Browns don’t sign the above three FAs, see what Dustin Keller costs. Sure handed athletic playmaker. The Jets did not franchise him which is a reflection of their cap hell, not that they don’t like him. If he’s still available after the first wave of signings, he’d a fine pickup. Alternate move: the draft is supposed to be deep at Tight End and seems probable that so talent will be around even in the fourth round. I haven’t fallen in love with anyone but Travis Kelce from Cincy or Gavin Escobar from SDSU seem like players worth looking at. Links: here’s the pre-eminent mock draft and a worthy alternative view on free-agency. Raiders’ pick actually not a pirate. Damn you Holgrum. Philly is on the clock, you’ll want to check back soon. I really like Pokorny’s piece at DBN today. He limits his piece to FA signings only. I’m with him on the priorities: he’s drafting on the edge and signing OG, TE, FS, CB, and DE/OLB. His picks aren’t my picks, but as long as we’re tending to the same areas of need, I’m mostly good. But I still want want Keenan Lewis. Greatest need, top value, max in-division effect == top priority FA: Keenan Lewis. By mburgermeister in Browns, Browns punt 2013, FA targets, NFL Draft on March 8, 2013 . I’m leery of being let down in free agency, mostly because of Haslam/Banner’s insistence on being a team that “builds through the draft.” Also, as much as I like Ziggy, it wouldn’t be a bad idea to use FA to shore up the DL and take Ogletree or Geno at 6.
i think if you cheap out in FA, that’s where you’re let down. must target top guys and guys the current team would like to keep. glad i’m not the only one on the ogletree train!